A recent study by Swedish scientists found a correlation, in a group of young people with asthma, between their asthma and a deterioration in their oral health. It was shown that those patients with a history of asthma reported of an increase in cavities, bad breath and gum problems. 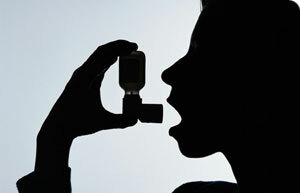 In most cases, the medication to relieve asthma can also cause a decrease in saliva flow. The “dry mouth” resulting from the reduced saliva flow then causes bad breath and an increase in cavities, because saliva serves as both a moisturizer and a cleansing agent for the mouth. If there is a lack of adequate saliva flow, asthmatic patients become more susceptible to a variety of oral health problems. And if patients are using inhalers with Corticosteroids, they will also be vulnerable to Oral Candidiasis, commonly referred to as thrush. This is a yeast infection in a form of a thick white deposit that appears on the tongue. Furthermore, if the patients are not diligent about flossing and brushing their teeth regularly, they will be more than likely to have gingivitis or gum problems. Other studies have shown that patients with a history of asthma tend to be more anxious about taking their place in a dental chair. Normally, your body will produce hormones that help your mind and body respond to stress. However, if you are taking asthma medication, especially steroids, the glands that produce hormones that help with stress relief may not be working properly. The result: asthmatic patients who have difficulty handling stressful situations, like going to the dentist's office, effectively. To keep the negative effects of asthma and its medications from occurring, or at least to a minimum, patients have to take extra care of their mouths. The first step is to make sure that you schedule regular visits with your dentist. Be candid when you go for your visit; be sure to discuss the medications you're taking, to describe your last asthma attack, and what triggers your attacks. That way, your dentist will know the best way to proceed with your treatment. Furthermore, there are good habits to cultivate, like regularly rinsing your mouth--especially after using your inhaler. Finally, to assure that your visit to the dentist is stress-free, you can request the use of nitrous oxide, or calming technologies like NuCalm®. Your dentist will be pleased to help you reduce the stress of your visits and to help keep you in the best oral health.